Writer Monica Wood, the author of "Papermaker," a play that draws on her experience growing up in a small Maine mill town. Tom Porter reports on the play "Papermaker" by Maine author Monica Wood, which premiere's at the Portland Stage Company. PORTLAND, Maine - Writer Monica Wood is known mostly for fiction, and for her best-selling memoir about growing up in a small Maine mill town. Now Wood is about to make her debut as a playwright and is once again drawing deeply on the experiences of her youth. Her play, "Papermaker," tells the story of a paper mill strike in the fictional Maine community of Abbott Falls in the late 1980s, and explores its effect on two local families. "You people keep voting against your own interests, you people keep voting against your own interests, there are larger forces at work of which you are not aware." With just a few days to go before opening night at Portland Stage Company, the cast of "Papermaker" is rehearsing every day. Seeing her characters come alive in front of her is a new experience for playwright Monica Wood, who, even at this late stage in the production, continues to make adjustments to the script. "Some of them I just kind of come up with when I see what's happening in the room, but others are, an actor might ask me for clarification on a line," she says. "So it's been a wonderful, wonderful thing for me, because I'm used to working in isolation. I'm a novelist." "Papermaker" features characters from Wood's novel "Ernie's Ark," and Wood also taps into the experiences she shared in her best-selling memoir, "When We Were The Kennedys," in which she describes growing up in the 1960's in Mexico, Maine, in the shadow of the Rumford paper mill. Hear more from "Papermaker" author Monica Wood. "When I was growing up, I called the mill my first metaphor," she says. "It was this omnipotent, God-like creature that took up most of riverbank, that had the power to give and take, and from nowhere in town could you not see it. It was a very powerful presence in our lives." Her grandfather, father and brother were all mill workers, and for her first foray into play righting Wood has stuck with a subject she's familiar with. "Papermaker" is a two-act play that takes place at the end of the third month of a bitter violent labor strike in a small Maine town in 1989." In 1986, Wood's home community of Rumford was hit by an 11-week strike as 1,200 paper mill workers walked out in protest over new working conditions. The following year, workers struck at the International Paper plant in nearby Jay. The strike lasted 16 months and became one of the most bitter and divisive labor disputes of the decade. This is the backdrop that informs the fictional strike that's at the center of the play. "It's about two families - one labor, one management," she says, "and how they, through circumstances I can't reveal here - come face to face, and are forced to recognize each other's humanity." 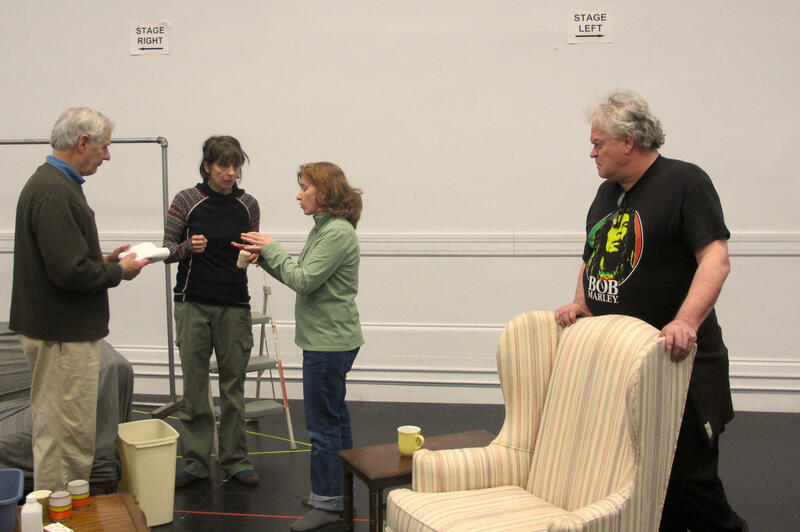 The cast of "Papermaker" at a recent rehearsal at Portland Stage Company: left to right, Tom Bloom (Henry McCoy), Lisa Stathoplos (Marie Donahue), Director Sally Wood (no relation to Monica Wood), and Daniel Noel (Ernie Donahue). Henry McCoy: "We have more in common than you think." Ernie Donahue: "Name one thing." Henry McCoy: "Paper - unless we do something right now, in 10 years people like me will be extinct and you'll be answering to some dead-eyed investment group." In this scene, paper company boss Henry McCoy - played by Tom Bloom - finds himself at the house of long-time mill worker Ernie Donahue - played by Daniel Noel - where inevitably the two get into an argument about the strike. Henry McCoy: "You think a dead-eyed investment group will love making paper?" Ernie Donahue: "Save it for the PR machine." Henry McCoy: "You think a holding company will stay up nights worrying about the papermakers? You think they'll try their damnedest to save 3,000 jobs?" Ernie Donahue: "By laying off 300 workers? By eliminating overtime? By cutting a man off at the knees two years before retirement?" "It's really a family play," Wood says. "It's a play about family dynamics, which is all I ever really write about, honestly. But the backdrop is so huge: It's about labor politics and small-town culture, and clashes of culture, so there's a lot going on in the play. It's very layered." And if there's a central theme to "Papermaker," says Wood. "It's the fact that we always have more in common than not, no matter now divided we may seem on the surface. We're all parents or children or neighbors or friends, and that's what survives." "Papermaker" opens at Portland Stage on April 21, and runs until May 24.